We love tortilla wraps here…have them all the time…and I have some great tortilla wrap recipes to share with you today! 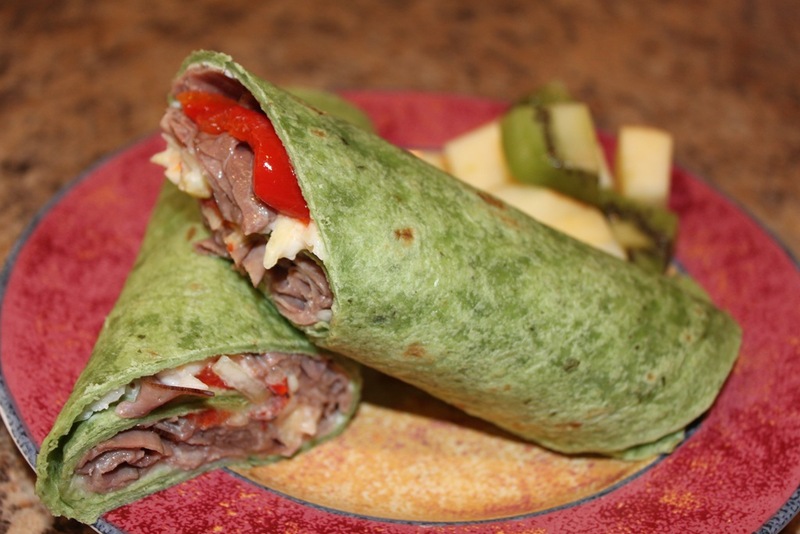 The one above is called “Roast Beef Tortilla Wrap”. It’s really quick to assemble, great for lunchtime, and you can easily swap out ingredients based on your likes! Schmear cream cheese and cole slaw on each tortilla. Layer with Roast Beef and marinated red bell peppers. Roll up tortilla cut in half. Sundried Tomato Tortilla, Turkey, Mushrooms, Sundried Tomato, Havarti Cheese Slices or Feta Cheese crumbles. Have more Tortilla Wrap ideas to share? Leave a comment, I’d love to have some more ideas! Some more great ideas! Thanks! One of our favourites is to lightly schmear the plain tortilla (we have the same issue with the spinach ones…) with artichoke and asiago dip then add left over roasted chicken, cubed mushrooms and avacado. Yummy! Equally good is just the dip and mushrooms – very light clean taste. Another is plain cream cheese with fnely diced red onion and diced peppers. This one gets rolled and cut int short segments and served as round. Good of nibbles at cocktail hour! Yum! That sounds really good. 🙂 We have buffalo chicken wraps for dinner a lot. Grilled chicken mixed with hot sauce and ranch dressing wrapped in a plain flour tortilla with lettuce, cheddar cheese, onions, and tomatoes. We usually have baked french fries, chips, or pasta salad on the side. I love to cook. No. Really. But I am so uncreative with sandwiches and wraps it’s just sad. I kind of stare at the ingredients and figure there must be a sammie in there somewhere but it never emerges. This was such a great and well-timed post for me! BBQ Chicken Wrap– Spread Ranch dressing lightly on sun dried tomato wrap. Combine can of corn (drained), can of black beans ( rinsed and drained), chopped tomatoes. Spoon some of this mixture down the center of tortilla. Top mixture with shredded romaine lettuce, shredded cheddar cheese, and chopped cooked chicken. Drizzle BBQ sauce on top. Yum!